Amazon is one the top five most admired companies in the world. It was founded in 1994. In 2009 its revenue was $24.5 billion, and its gross income was $902 million. What business principles can we learn from Jeff Bezos founder of Amazon? Can we image life without Amazon? What is their story and what can we learn from it? Jeff graduated from Princeton in 1986 with B.S. in electrical engineering and computer science. He worked for Fitel a start-up firm in New York building a financial trading network. Bezos then went to Bankers Trust where he become a vice president. His next job was with D.E. Shaw & Co. where he a focused on insurance, software and internet business opportunities. He quickly became a vice president. As Jeff learned about the internet and software he become excited when he discovered that the Internet was growing at a rate of 2,300% a year. He was fascinated with the prospects of online commerce. As he thought about it, his passion and talent was in business, investments, the internet, and computer science. He believed there was economic opportunity in e-commerce. He had found his “sweet spot.” The real question was, did he have the guts to leave a job he loved and take the risk? He and his wife jointly made the decision. Jeff quit his job, and they moved out to Seattle where he started meeting with venture capitalists to raise money. Jeff officially started the business in July of 1995 from the garage of his rented home in Seattle. Jeff’s strategy, innovation, flexibility and his focus on key business principles has proven to be a winning combination. During Amazon’s first few years investors were hammering Amazon. The dot.com bubble added to the fuel. Despite revenue, Amazon was not profitable. A business principle Jeff believed in the long-term. As an investor, he found that most companies give up too quickly. Amazon has an impressive strategic plan and the leverage important strategic planning tools. Bias for Action: We live in a time of unheralded revolution and insurmountable opportunity–provided we make every minute count. Jim describes the best leaders of the companies that became great as “level 5″ leaders. They are ones who built “enduring greatness through a paradoxical blend of personal humility and professional will.” A level 5 leader is first and foremost ambitious for the cause. Jim also discusses what he calls the “hedgehog” concept. 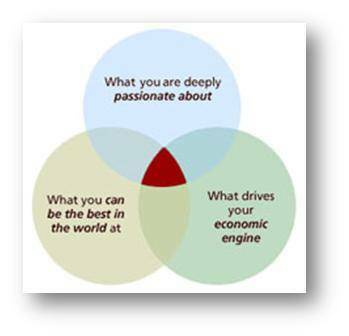 He found that the great companies (also applies to individuals)identified and focused on their “sweet-spot” where talent, passion and economic opportunity merge – see the diagram below. Instead of writing about Jeff’s humility and his professional will, and his focus on his sweet-spot, and please see it for yourself below.